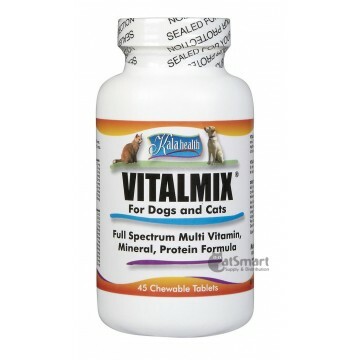 VITALMIX™ Chewable Tablets are more than an tasty all-natural multi-vitamin, it is the ultimate blend of amino acids, vitamins and minerals. Together these natural ingredients support a healthy immune system and circulatory functions thereby promoting optimal health in your pet. The formula was developed by and for veterinarians to offer the essential vitamins, minerals and proteins that may be absent in standard dog and cat food, or may be lost in the processing of food. In total VITALMIX™ contains 21 amino acids, 11 minerals and 14 vitamins. 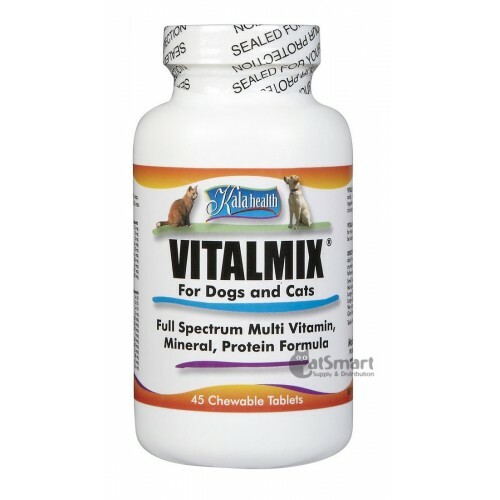 The addition of these 21 amino acids makes VITALMIX™ truly unique and revolutionary in the world of multi-vitamins for pets. To make this already amazing health supplement even better VITALMIX™ also contains several additional ingredients, including whey; fish protein and whole eggs to super charge the protein concentration. Your pet is going to love the taste and you are going to love their improved health and vitality. Dextrates, Maltodextrin, Whey, Natural Flavorings, Stearic Acid, Dicalcium Phosphate, Silicon Dioxide, Potassium Chloride, Cellulose, Gum Ghatti, Egg Albumin, L-Carnitine, L-Taurine, Sunflower Oil, Ferrous Fumarate, Choline Bitartrate, DL-alpha-Tocopheryl Acetate, Fish Protein Concentrate, Ascorbic Acid, Zinc Acetate, Magnesium Oxide, Inositol, Pantothenic Acid, Niacin, Vitamin A Palmitate, Riboflavin, Thiamine Mononitrate, Pyridoxine Hydrochloride, Manganese Gluconate, Vitamin D3, Copper Gluconate, Potassium Iodide, Sodium Selenate, Vitamin B12, Biotin, Folic Acid. Small Dogs (less than 20 lbs. ): 1 tablet daily. Mid-sized Dogs (20-40 lbs. ): 2 tablets daily. Larger Dogs (41-60 lbs. ): 3 tablets daily. Very Large Dogs (81-100 lbs. ): 5 tablets daily. Giant Breeds (100-150 lbs. ): 6-7 tablets daily. WILL CATS EAT IT? For finicky cats, simply crush one half or a whole tablet and mix with a small amount of tuna or wet food. We have found that this works with almost all cats.